micro elements - Hortiland Holland B.V.
Micro elements are necessary for the well functioning of plantcells. Whereas quantities needed are very small, their deficiency could result in a serious decrease of production. 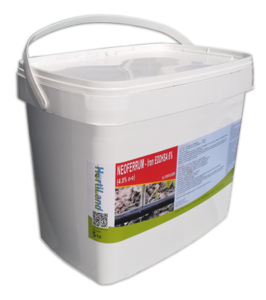 HortiLand offers a complete range of microelements to avoid or to cure deficiencies. Horti-Color Spray is a high concentrated composition of polysacharites. It is applied in fruit bearing crops for the immediate increase of their sugar content (BRIX) and the improvement of the fruit colour as well as the taste. Horti-Color Spray contains 25% organic matter and is applied by foliar application. It improves earlyness and the shelf life of the product after harvest. 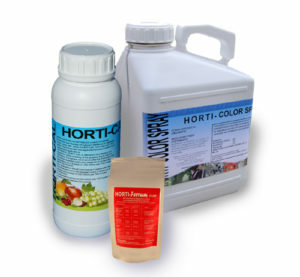 Horti-Color Root is a high concentrated composition of polysacharites and monosacharites. It contains 30% organic matter. It is applied by drip irrigation and improves the sugar content of the fruits as well as the taste. Horti-Color Root also improves the microbacterial activity near the root system, thus resulting in the development of the roots. Composition with two types of Iron Fe EDTA and Fe EDDHMA for application via drip irrigation but also used for foliar application. Special combination to prevent and cure more than one deficiency of micro elements for foliar application but also used for foliar application. Contains 7% Fe EDTA. Combination of micro-elements with high contents of MgO and Mn. To be applied via drip irrigation or foliar application.